Now that dealers in the launch markets are able to order Chevrolet Volts for customers, they have been given copies of the 2011 Chevrolet Volt Initial Ordering Workbook. A copy of the document can be downloaded here. 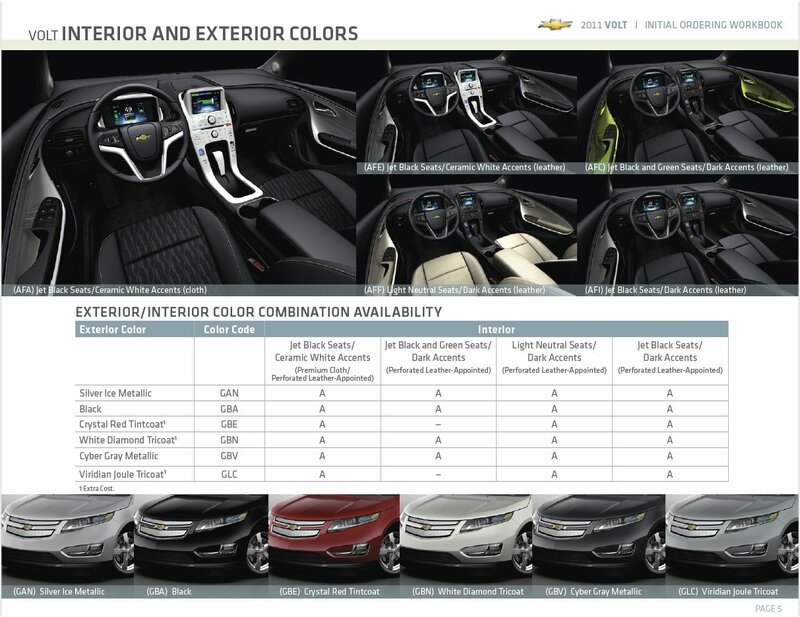 For the first time we are able to see the interior design options that are available on the car. The standard is a “premium cloth” dark fabric with white accents, which includes the white center console. The dark charcoal center console is only available if the buyer pays for the premium trim package which includes leather seats, leather-wrapped steering wheel and graphic door inserts. The options with leather include black seat and white center console, black and green seats with dark center console, black seats and dark center console, or light neutral seats with dark center console. Other neat features included a 30 Gb hard drive for music file storage and a “timeshift function” that lets users record audio broadcasts similar to how a DVR works.